The BYBO service is simple and easy-to-use. Clients will be able to shop for a variety of Beau’s brands and merchandise online at the Beau’s website, www.beaus.ca, as well as a standalone new site,www.bybo.ca. Checkout and payment is done online via PayPal, and the order is confirmed by email. The orders are delivered in the evening within 72 hours, based on the delivery routes used by Operation Come Home — clients receive confirmation of their order by phone the day of delivery. The delivery “fee” of $15 is collected by Operation Come Home, and a charitable receipt is issued to the purchaser for a portion. The service will even collect empty Beau’s beer bottles upon request. “Now you can buy your beer from Beau’s, and at the same time create jobs for homeless youth,” says Elspeth McKay, Executive Director of Operation Come Home. The online portion of the BYBO home delivery service launches in the City of Ottawa November 23, with delivery service to begin the next day. Postal codes eligible for home delivery are: (West Route) K2A, K2B, K2E, K2G; (Central Route) K1Y, K1R, K1P, K2P, K1S, K1H, K1Z, K2C; (East Route) K1M, K1N, K1L, K1K, K1J, K1G, K1B. 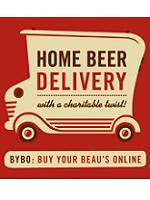 Additional information about the BYBO service will be posted online at www.beaus.ca in the next few weeks approaching the delivery launch date of November 24.